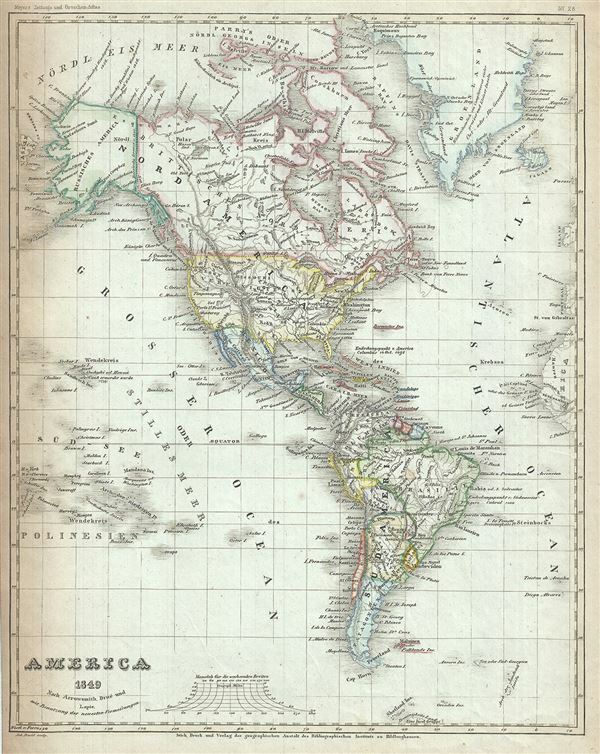 This is a scarce 1849 map of North America and South America by Joseph Meyer. The map covers all of North America as well as South America from the Arctic to Cape Horn. In North America, Russian and British territories in Alaska and Canada are clearly noted. In South America, Chili extends southward only to the border of Patagonia, while Bolivia has a coast. Meyer marks the territories and countries with outline color and notes major cities, rivers, mountains etc. Elevation is rendered in hachure. This map predate the Gadsden Purchase despite postdating the Mexican American War, consequently the R. Gila is the southernmost boundary of the United States. This map was issued as plate no. 28 in Meyer's Zeitung Atlas. Although all the maps in this atlas are not individually dated, the title page and maps were often updated while the imprint with the date was not, causing confusion to the exact date for some of the maps. Moreover some maps in the atlas were taped in at a later date as an update to the atlas. We have dated the maps in this collection to the best of our ability.